It was a few days ago, December 23rd to be exact. Yes dear, I probably could have picked a better day ……. seems like it was hectic for everyone – everyone else but not me…. I should have known that there were different expectations????? The all grain process does chew up some time. I don’t wear a watch so a good portion of the day got away from me before I started. It was dark by the time I was finished and beginning the clean-up. From a technical standpoint the brew came off flawless……. I hit the volumes, the starting gravity, the color and if the flavor of the sample from the gravity measurement is an indicator, it will be very nice! In less than two days the fermentation was in high gear and I should transfer to the secondary in a couple of days. I plan to make a small change to the recipe. I plan to add Raspberry Puree to the secondary fermenter for flavor. The folks at the local brew shop suggested the that I should obtain better results. Time will tell. Low tech but effective outdoor brewing set-up. I finished drinking the little dab of Belgian Wit that was in the fridge and had a couple of my Golden Wheat Red IPAs while brewing. The Tap-a-Draft mini-keg really works well and added just a wee bit more CO2 – makes it an outstanding beer! Gotta have a homebrew when making homebrew! Plans – my son Ben is asking for just a plain run of the mill Pale Ale – then he said it must have great flavor and be easy to drink…….the search for a recipe begins…..IPA flavor but less alcohol….as session IPA. I can do it! 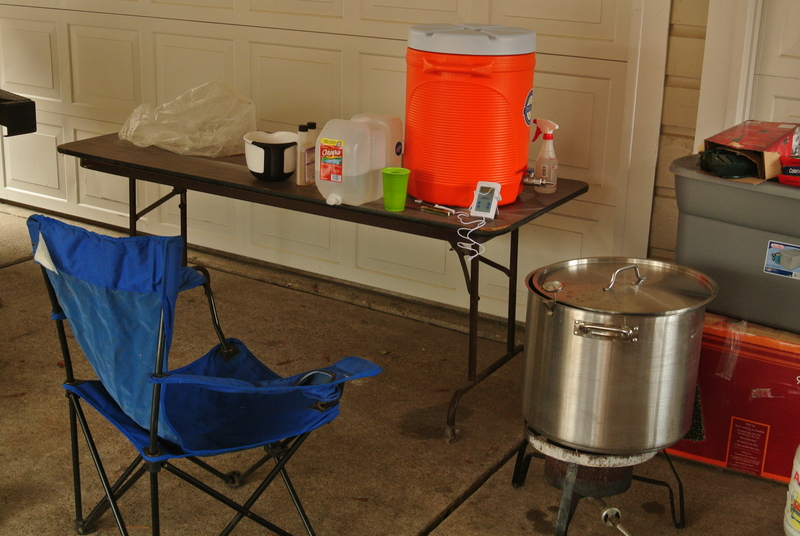 This entry was posted in Ale, Beer, Homebrewing and tagged IPA, Raspberry Wheat Ale, secondary fermenter.